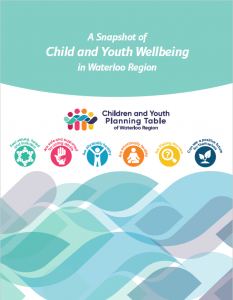 The Children and Youth Planning Table of Waterloo Region has a vision for happy, healthy children and youth – today and tomorrow. To achieve this vision, we have 6 Shared Goals for Child and Youth Wellbeing. This report is a snapshot of how children and youth in Waterloo Region are faring when it comes to wellbeing, across these 6 Shared Goals. There are 32 measures that have been named by the Children and Youth Planning Table as a place to start when measuring child and youth wellbeing – it is these measures that are highlighted in this report. The Children and Youth Planning Table will be developing a Child and Youth Wellbeing Dashboard. The Dashboard will go beyond averages at the region level and provide a more detailed look into the wellbeing of children and youth across Waterloo Region.